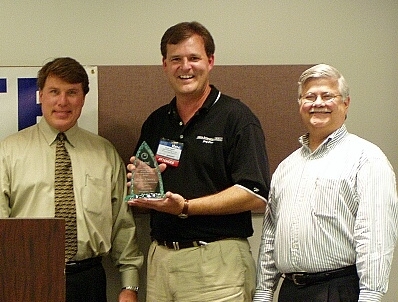 On November 12, 2003, the Austin chapter of the Association of Information Technology Professionals (AITP) presented the sixth annual Austin IT Executive of the Year Awards in conjunction with the Austin ITEC - the region's largest gathering of IT executives, educators & vendors. The ITEC/AITP awards ceremony was held at the Austin Convention Center, and it was attended by over one hundred and fifty area IT professionals. The keynote speaker for this year's event was Speaker Leah Ward-Lee, host of The Executive Toolbox. She gave the audience an overview of the history of major technology developments, as well as the techie jokes associated which each new advance. She proved to us all that IT professionals are still the only people who ever seem to understand the humor behind these jokes! "This event continues its ongoing tradition of highlighting the important IT achievers in Austin," said AITP president, Bobby Afshin. "We're pleased to honor this year's IT leaders such as Tom Ballard, Gary Cowsert, Fred Mapp, Peter Collins, and Russ Finney who have been equally recognized by their employees, their peers, and the community as a whole." "The Austin IT Executive of the Year honors continue to be the only awards recognizing Austin CIO, CTOs, VPs of Engineering and their peers," said Scott Calvin, this year's awards chairman. "These leaders are being recognized because of their continuous dedication to high quality operations and achievements which in turn continue to fuel Austin's reputation as a city of technology innovation." The primary sponsors of the event were IBM Corporation, Neogent, Inc., and Momentum Software. Three major awards and two special honors were presented: the Austin IT Executive of the Year - Private Sector, the Austin IT Executive of the Year - Public Sector, the Austin Information Technologist of the Year, the National IT Influence Award, and the Executive Leadership Award. Fred has a passion for the high tech industry and he focuses on how AMD's products and services can be used by IT organizations to gain a competitive advantage. Fred kicked off three initiatives in 2003 to help demonstrate the value of AMD as a company and how its IT organization can add value to the high tech industry. The first initiative was to explore how IT could become a profit center by providing services to the high tech industry which complements AMD's product offerings. The second initiative focused on utilizing AMD's product portfolio to run AMD's mission critical applications to provide a real life benchmark for the rest of the industry. The third initiative involved partnering with software vendors to apply AMD's world class FAB processes and technologies to world class solutions. Most companies look at the business of IT as a cost/burden of operating a company, Fred has elevated his IT organization to look for opportunities to improve the bottom line of the company as well as AMD's business partners. Fred's industry influence extends well beyond the corporate walls of AMD. He has been an inspiration and mentor to countless IT professionals throughout the years. Fred currently serves Advanced Micro Devices as its VP of Information Technology and CIO reporting directly to Hector Ruiz, president and chief operating officer of AMD. 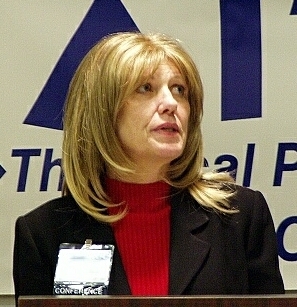 Prior to joining AMD, Fred served as Vice President and CIO of Information Technology at Honeywell Corporation for its Industrial Automation Controls Division, and he also served at American Express where he was instrumental in the development and implementation of new applications and services and in the re-engineering of the information technology organization. He has also held key executive IT positions at IBM, InfoSpan Corporation, and his own company, Quality Service Solutions. Fred continues to contribute his knowledge and passion for IT through his speaking and writing activities. He continues to make contributions to the industry through his various national and local board positions. He has been a highly respected member of the Austin IT community since joining AMD in the year 2000, and he continues to represent our community on a national stage through his innovative thinking and deep industry influence. 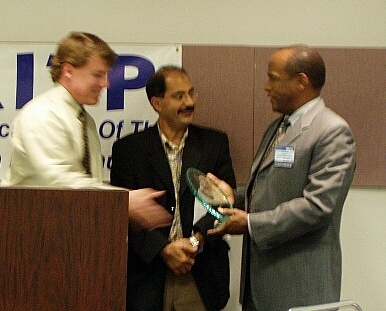 ITEC and AITP are pleased to honor him with the National IT Influence Award. During the past 12 months the Information Technology team under Gary's leadership implemented many new technologies into Activant, including a full scale Oracle 11i application suite implementation on a new Dell / Linux environment using an Oracle 9i RAC cluster, the addition of Microsoft Exchange 2003 including a full Active Directory implementation for 20+ servers and 1300 users, a build out of the DataCenter which required a revision and update to the overall infrastructure, and a network conversion from legacy frame-relay connections to a modern VPN over IP WAN which placed the DataCenter at the hub of a new 'star' topology network. These new IT implementations also required the introduction of multiple new business processes and production disciplines. With these new processes, the IT group now successfully manages over 40 products, has implemented change management within the group, developed new maintenance windows, and instituted version control for maintenance. The new ERP system has required the business to reflect on all current processes and compare them to industry 'best practices'. Over the past eight school months, Gary was instrumental in Activant's community participation - including the dedication of 69 volunteer hours from the IT staff every Friday afternoon at two disadvantaged Austin middle-schools, performing routine break-fix repairs as well as more complex projects involving network and server implementations. In his work as overall Project Director for the RDMT family of Projects, Peter Collins has been responsible for implementing a series of information technology projects for public safety in Austin and Travis County. These information technology projects for public safety in Austin and Travis County are comprised of the Regional Radio System, Computer Aided Dispatch system, Mobile Data, Transportation Management, Records Management and the Combined Transportation Emergency and Communications Center (CTECC). These projects have merged to create a state of the art communications facility which will provide a common facility for agencies to use to jointly manage response and mitigation of disasters. The combined value of these projects exceeds $125,000,000. In each of these projects, Peter's regional approach coupled with partnering with other governmental agencies has been the corner stone to ensure improved service delivery while keeping costs manageable. Throughout the implementation of these new systems, Pete has worked to ensure that each participating agency was respected and treated as an equal, regardless of size or participation level. These partnerships have brought national recognition to Austin and Travis County for its efforts to ensure that the needs of the citizens served are placed above everything else. His nomination this year included letters of recommendation from the Austin City Manager, the head of the Austin Police Department, the head of the Austin Fire Department, and the Executive Director of the Austin - Travis County Emergency Medical Services. Among Pete’s past awards are the prestigious Herman Goldstein award for excellence in community oriented and problem oriented policing. This national award is given annually to a law enforcement agency and in recognition of programs that focus on solving underlying causes for crime. During his career with Austin Police Department, Pete received the Civil Achievement Award and the Life Saving Award and as an Officer for Sonoma County Sheriff, Pete was recognized for outstanding achievement. 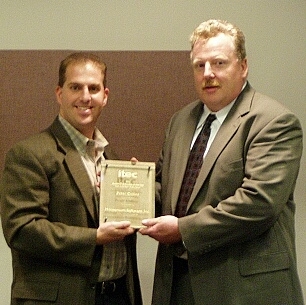 Pete is also the recipient of the Government Technology Conference (GTEC) Public Sector award. During the past year, Tom Ballard, CTO and VP of Technology at Hoover's, has led his staff through a complete rewrite and redesign of the Hoover's Online Web Site. The goal of the redesign was to provide more intuitive navigation, increase the performance, and deliver more powerful search tools to Hoover's millions of customers. The new web platform was transformed from a pre-packaged content management software system with a high-end database, to a system developed in-house on an open sourced platform. Using an open source approach provided for a more cost-effective and robust way to re-build the Hoover's dynamic, data-driven web offerings. The redesigned website also included a complete rewrite of the Hoover's Content Management System that the Hoover's staff of 80 writers and editors use to enter content on company information for over 30,000 companies. The rewrite included adding extensive functionality to the system and also considerably improved the performance of the system, which enables the Editorial Staff to do their job much more efficiently. It has increased their production by more than 20 percent. The new site is based on a subscription model. The intent is to help customers get needed information with just a few clicks. Based on extensive customer feedback, marketing research has concluded that the new site is easier to navigate, with a significantly faster page delivery. This impact is giving Hoover's a higher retention rate and increased subscription sales. Amazingly, in the middle of the project, Hoover's was purchased by Dunn & Bradstreet. Tom did an excellent job at keeping the IT staff focused on the redesign in the midst of this huge transaction. Overall he has been seen as being successful in his role of providing executive leadership in the design and development of this large project, and it has already reaped many rewards and kudos from the large Hoover's customer base. A surprise award was presented to Tokyo Electron America's Russ Finney in recognition of his many recent years of service to the Austin technology community. 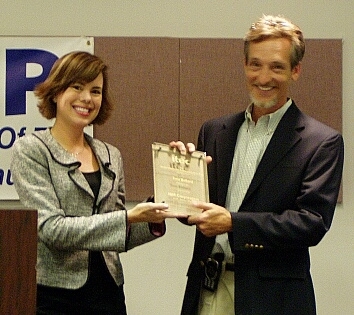 The "Executive Leadership Award" was given to Russ based on his commitment and involvement with organizations such as Austin AITP, Austin ITEC, and the Austin Technology Council. Over the past ten years he has also been very active in the establishment of a variety of localized technology events and seminars. At a national level, he recently served as the regional representative of Texas and surrounding multi-state area on the national Association Board of Directors of AITP. 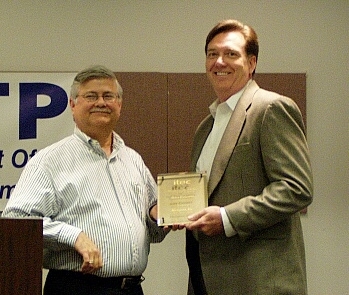 In the past, Russ also served as the local President of both the Houston and the Austin chapters of AITP. This year's recipients were chosen by Joe Harlow, CTO, Travis County-Information and Telecommunications Systems, Ray Schwitters, President, Triangle Technology, John Ciulla, CEO, Neogent, Inc., Russ Finney, CIO, Tokyo Electron America, Inc., and Jikku Venkat, CTO, United Devices.